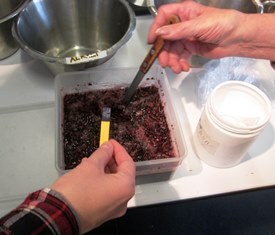 Testing the pH for the alkaline colour extraction method. 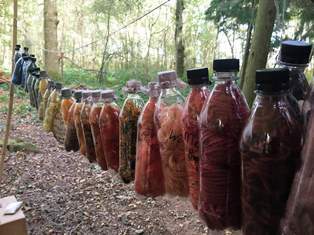 If you click on the above link you can then navigate forwards and backwards to see all the posts from the beginning of the course. 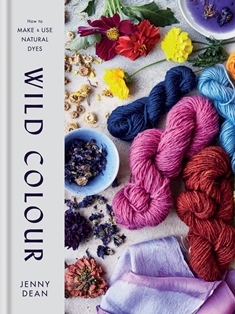 I’m delighted to report that the UK edition of my book Wild Colour will be available in hardback from December 6th 2018. 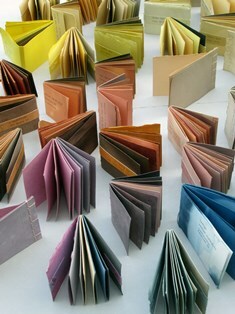 It has a new cover but the contents remain the same. 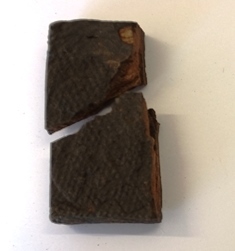 Below is an extract from the publisher’s press release. 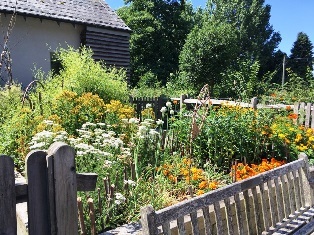 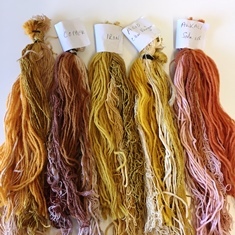 Wild Colour is a celebration of the wealth of natural dyes that can be obtained from plants, from the common marigold to rhubarb. 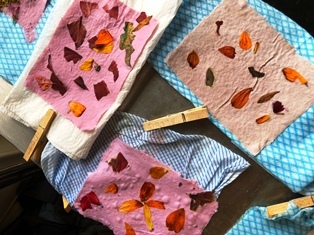 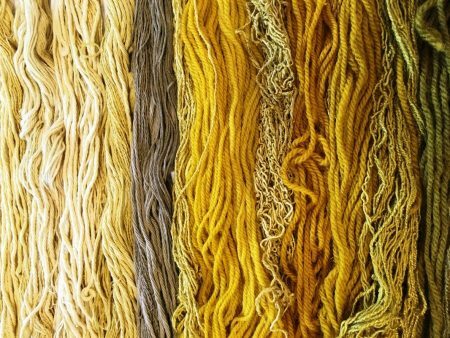 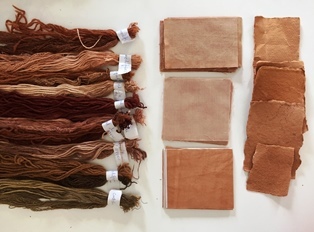 This practical and inspiring guide to creating and using natural dyes from plants offers information on current environmentally friendly dyeing techniques and more than 65 species of plants and natural dyestuffs. 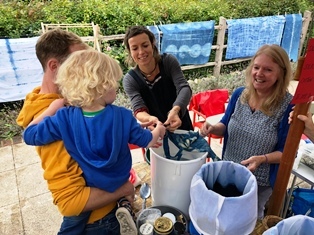 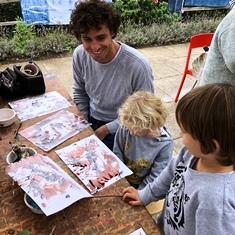 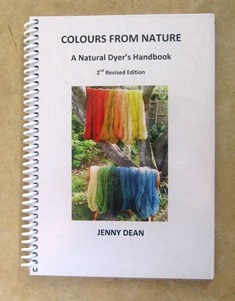 Wild Colour is the all-in-one resource for fibre enthusiasts, including knitters, sewers and weavers, gardeners who are interested in new uses for traditional dye plants and eco-conscious DIYers who want authoritative information about the natural dyeing process and the plants that are essential for it. 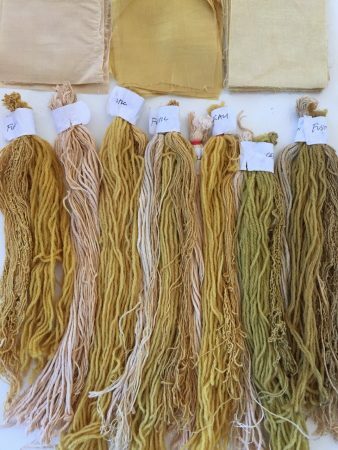 At this session we concentrated on dyeing with alkanet root (Alkanna tinctoria), cutch (Acacia catechu) and rhubarb root (Rheum spp.) 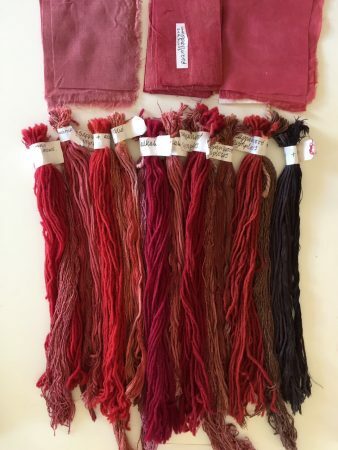 All these dyes are substantive, so no mordant is necessary. 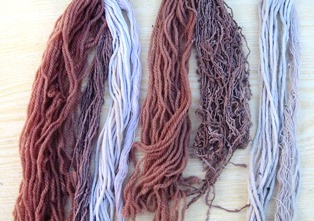 However, we added an alum-mordanted wool sample to the alkanet dye bath, as this should give a lavender shade. 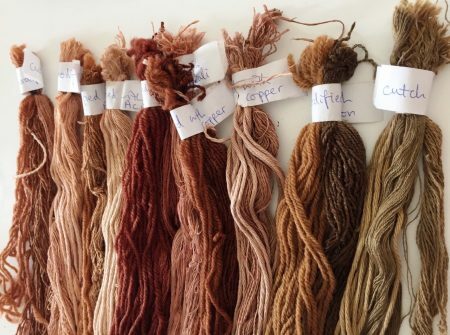 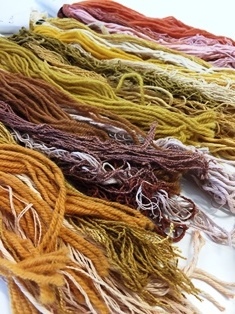 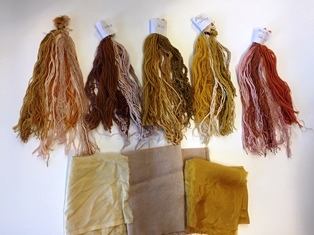 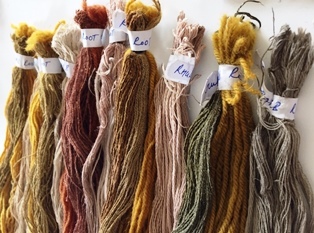 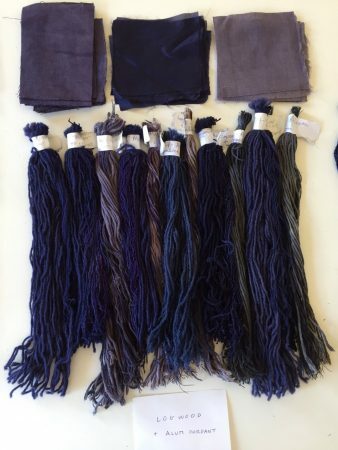 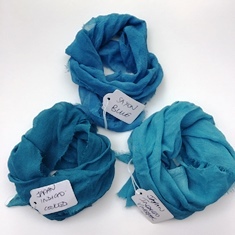 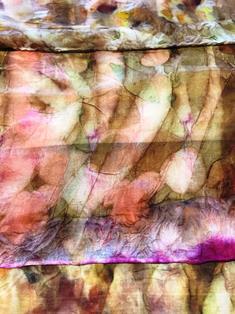 As usual, we tested the dyes on wool, silk, cotton and linen fibres and applied modifiers after dyeing. 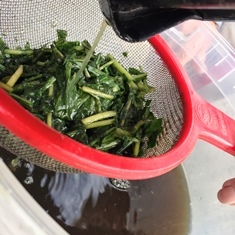 As modifiers we used clear vinegar (acidic), soda ash (alkaline), copper water and iron water. 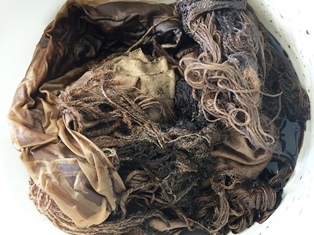 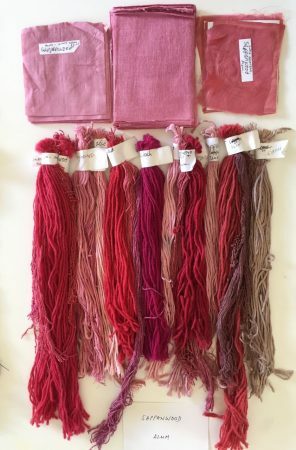 To simplify the process, we tied the alkanet root and the rhubarb root into muslin bags before adding the water to the dye pots. 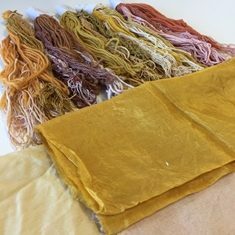 This means the dye bag can be removed from the dye pot once the colour has been extracted, so there is no need to strain off the dye liquid. 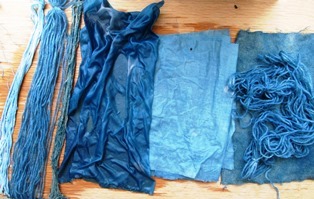 The dyestuff in the bag can usually be simmered again for a further dye bath. 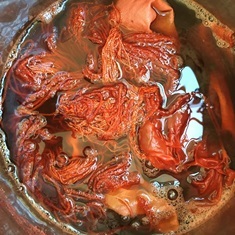 With the exception of cutch, the dye baths were prepared by simmering the dyestuff for about 40 minutes to extract the dye colour. 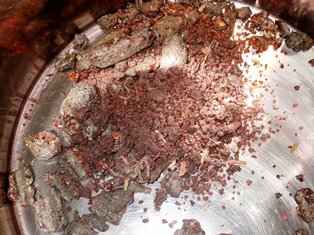 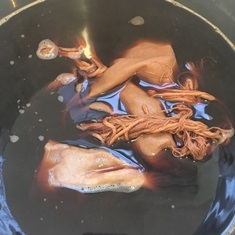 Cutch is usually supplied as an extract in powder form, so it needs only to be carefully mixed with warm water and then stirred into the dye bath. 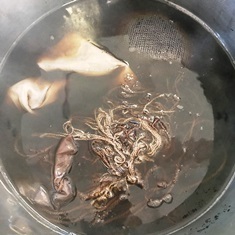 It is important to make sure the cutch has dissolved completely, otherwise any loose particles will cause stains and spots on the fibres. 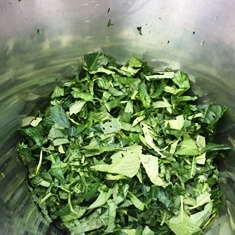 Alkanet root produces a less than pleasant aroma when simmered and without a mordant usually gives colours in the grey/green/brown range. 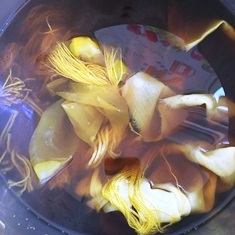 The purple dye is best extracted by soaking the root in rubbing alcohol or vodka for several days or even weeks before simmering it for dyeing. 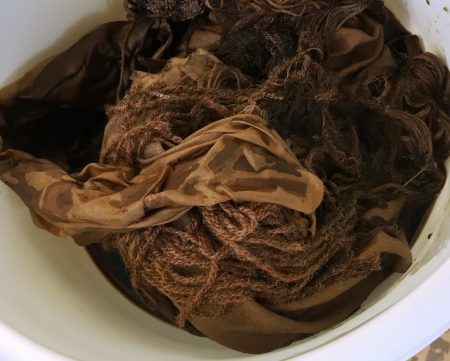 However, the dyeing process produces unpleasant fumes and great care must be taken to keep the solution away from naked flames, as it could easily catch fire. 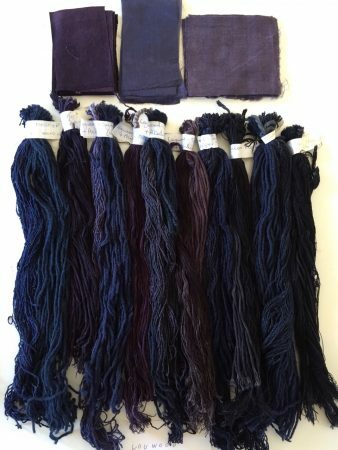 And it cannot always be guaranteed to produce purples. 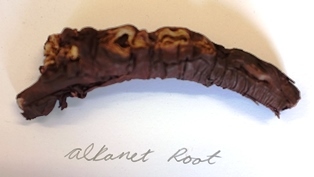 (See my earlier post on Alkanet Root for more details.) 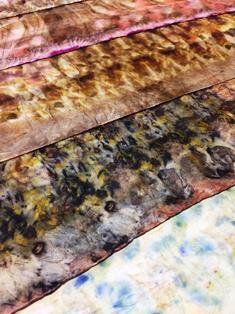 Unfortunately, using an alum mordant did not guarantee purple either this time, so once again my experiments with alkanet had limited success. 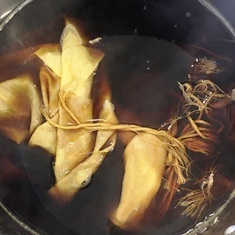 In Japan, the roots of the purple gromwell plant, Lithospermum erythrorhizon, which look very like the roots of Alkanna tinctoria, are used and tend to more reliably produce lavender and purple shades. 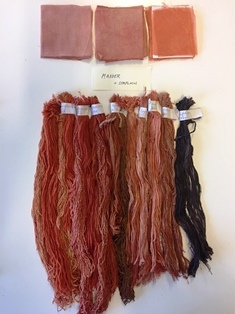 Rhubarb root is always interesting to use, as it reacts so positively to the modifiers and a wide range of shades can be achieved. 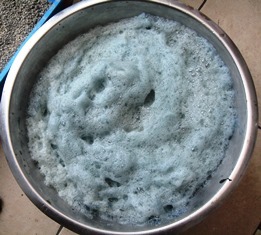 And as an added bonus it doesn’t smell unpleasant either. 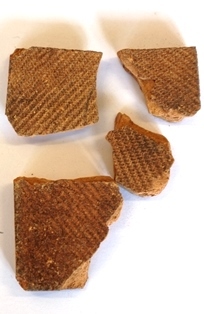 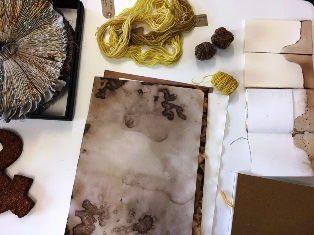 Part of each session is devoted to assembling the dried samples from the previous month onto sample cards and it is always a pleasure to see the results from each session. 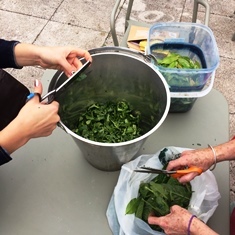 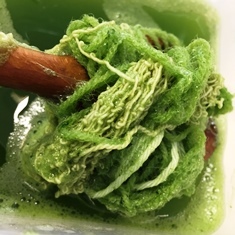 The tasks of mordanting and preparing samples is also ongoing and at this session we treated animal fibres with a rhubarb leaf base and also mordanted more fibres with tannin. 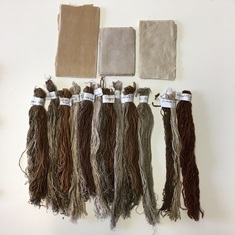 We will be using these samples at a later date. 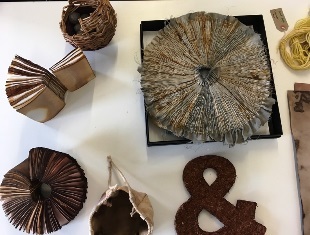 The first session of this one-year course was on March 18th and I was delighted when I met the 12 students we had selected. 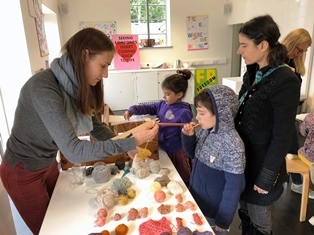 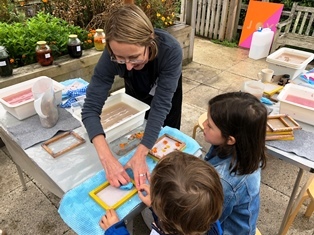 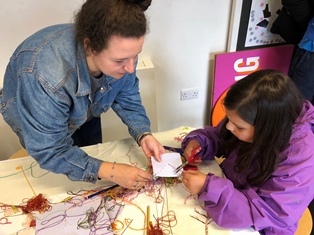 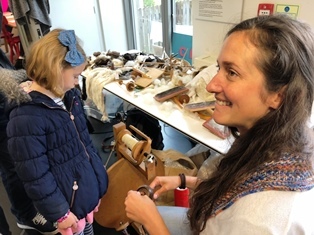 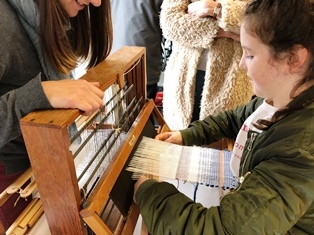 The range of skills they represent include weaving, bookbinding, papermaking, basketmaking, costume designing, feltmaking and several other art and craft practices. 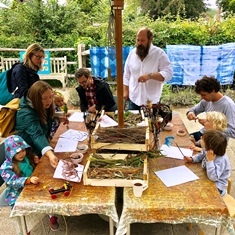 Their interest and enthusiasm, together with their searching, intelligent questions make the group both a joy and a challenge to work with. 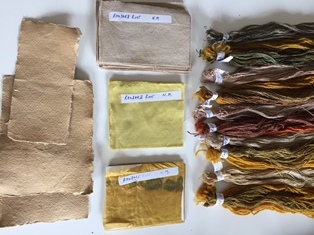 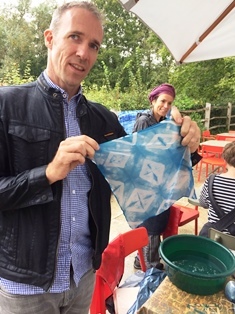 At this first session, after the students had talked a little about themselves and their creative practices, I gave a general introduction to the history of natural dyeing and the most significant dyestuffs and outlined the contents of the course and some of the techniques we would be covering. 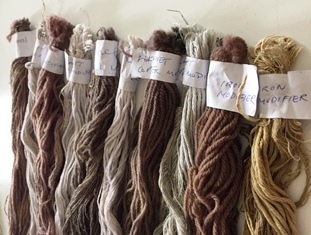 I also explained the difference between dyes and stains and emphasised the importance of selecting dyes with good levels of fastness, especially if producing articles for sale. 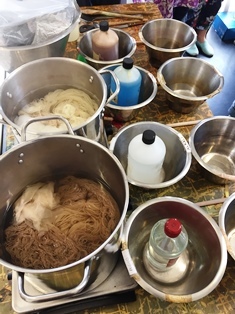 We then set up some mordant baths using aluminium potassium sulphate for the protein (animal) fibres and aluminium acetate for the cellulose (vegetable) fibres. 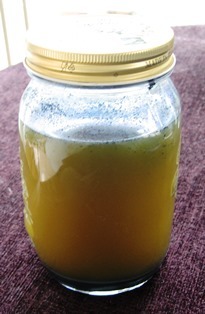 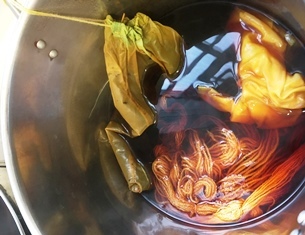 We also used tannin as a mordant and at the May session we will embark on mordanting using aluminium from symplocos leaves (see my earlier post on symplocos) and preparing wool and silk fibres with rhubarb leaf base. 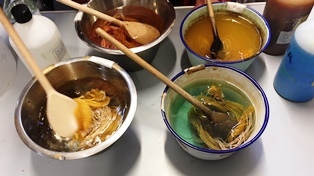 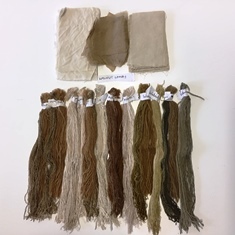 We used wool, silk, cotton and linen yarns and pieces of silk, cotton and linen fabric and, as buckthorn bark is a substantive dye, we didn’t use a mordant. 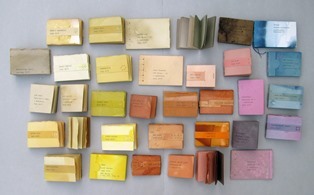 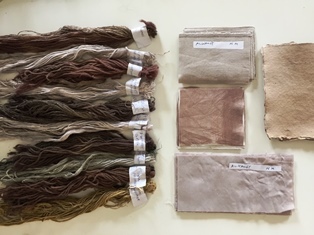 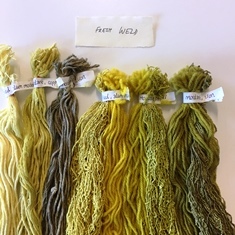 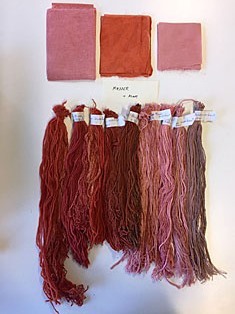 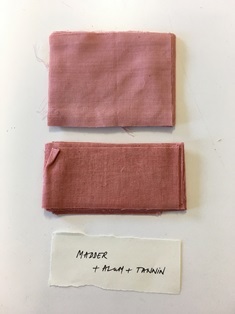 After dyeing, the samples were modified using 4 modifiers: an acidic modifier (clear vinegar), an alkaline modifier (soda ash), and copper and iron modifiers. 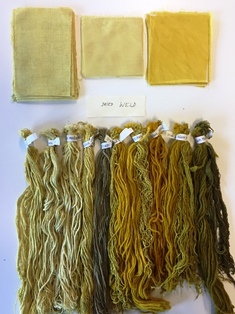 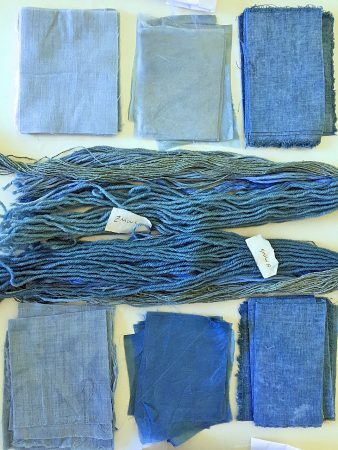 Two sets of samples remained unmodified, one for purposes of comparison and the other to be over-dyed with indigo at a later date. 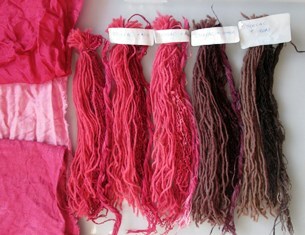 This method of sampling will be used for all the dyes we test, with a few variations for specific dyes. 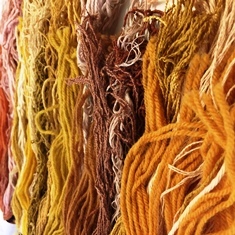 The students also wound more skeins and cut more pieces of fabric for later sessions. 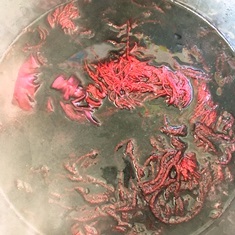 The photos below show some of processes and the results. 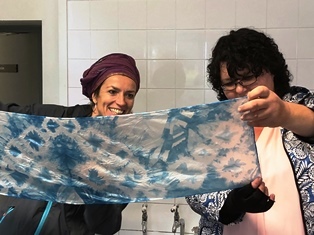 Note: I am extremely limited in what I am able to manage physically and this course would not be possible without the support of my wonderful assistant, Deborah Barker. 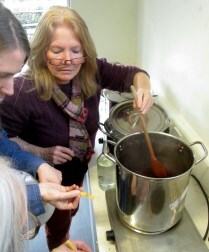 I am so grateful to her for all her help in making everything run smoothly.